Landmark Tower ( Landmark Tower) (横浜ランドマークタワー Yokohama’s the Random ā ku Taw ā ) – the third-tallest building in Japan and the first in the city of Yokohama – 296.3 meters. Tower Landmark Tower is located in the port district of Minato Mirai 21 – the fastest growing area of ​​the city. Construction of a skyscraper completed in 1993, at the time the viewing platform of the tower was considered the highest in the country. Lift, which takes place climb to the observation floor, until 2004, was considered the world’s second ascent rate, but eventually won the second place was taken by the Taipei 101 skyscraper. 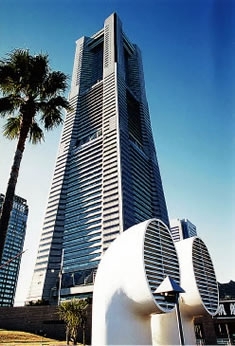 Landmark Tower – a significant landmark Minato Mirai. In its many floors are offices of companies, shopping and entertainment centers, hotel, clinic, observation platform Sky Garden (69 floor), from which on a clear day offers views of Mount Fuji-san, and a small park Dockyard Garden. In total, the Landmark Tower, 76 floors – 73 surface and 3 underground.